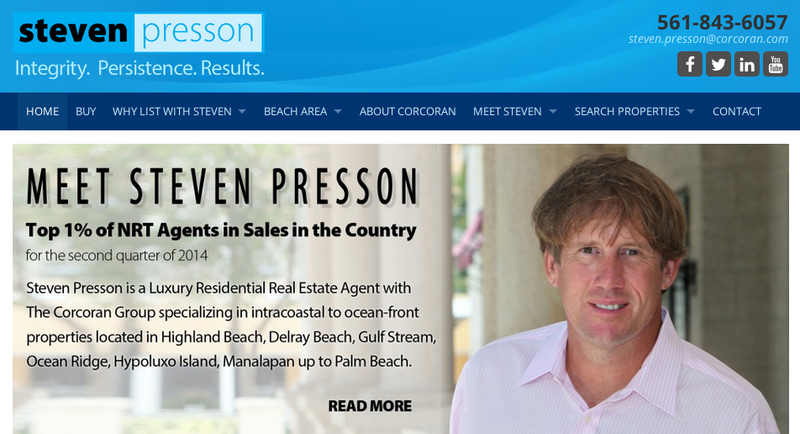 Palm Beach, Florida, August 15, 2014	(Newswire.com) - It's not easy being among the best in the nation at anything, and Steven Presson of Corcoran Group Real Estate in south Florida knows that. Recently named in the top 3% of the more than 2-million realtors nationwide, Steven realized that to maintain his edge in his profession, maximizing his use of website and social media technology have become key factors in providing information and access to potential real estate clients not just in south Florida, but nationally and internationally is a requirement to be the best in his field. When asked how he differentiated his new website from others, Presson said, "The breadth and depth of the services and information are what differentiates this website from most others. We spent 6-months creating it so it's extremely complete and incredibly user-friendly." Our new site is designed to showcase luxury properties in south Florida in a way that out of state and international buyers can tour the homes directly, and divided the searches into the specific areas and local town offering upscale properties in the Palm Beaches, including: Delray Beach, Gulf Stream, Ocean Ridge, Palm Beach and Manalapan. We then went a step farther knowing that some buyers and investors want their properties to have direct access to the water or a beach by creating searches specifically for Ocean and Intracoastal homes that cover the entire County. We've we've included information on local private resorts and clubs and for families with children a list of some of the best private schools in the area as well as details about those areas that provide beneficial information for people considering south Florida but live elsewhere. Knowing that not everyone uses the same technology or operating system we designed our website to be very user-friendly and function seamlessly across multiple platforms including Windows, Mac, Android & I-Pad.